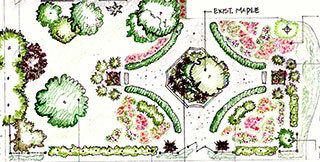 Gardendigs Landscape Design is located in Tacoma, Washington. Owner Susan Ryan has a Bachelor of Fine Arts in Interior Design from the San Diego Design Institute. She began her career in 1992 as an Interior Designer with an emphasis on health care facilities. Her work earned awards and was featured in major publications. She became a Washington State University Pierce County Master Gardener in 2010 and maintains 35 hours annually in continuing education and volunteer service. You may occasionally find her at a local farmers’ market, working in the Master Gardener office or doing a special project. Susan studied landscape design at South Seattle College's Landscape Design, Construction and Horticulture Program. In 2011, she joined the Association of Professional Landscape Designers (APLD) as a student member and plans to apply for her APLD Certification in 2018. Her involvement with APLD has included volunteering with the program committee, helping with the annual summer garden tour, symposium and other events. She believes volunteering adds value to the program and has provided her with the opportunity to engage and collaborate with peers. A love of nature and desire to create beauty led Susan from interiors to landscape design. She also enjoys a collaborative process with clients to get the desired results. Together, she and her clients review challenges and determine the approach. Her goal is to assure clients’ needs are met, that they receive value for the services provided and are truly happy with the finished design. Always personable and friendly, Susan’s ready smile puts people at ease. 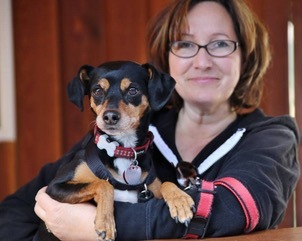 An avid animal lover, she enjoys meeting client pets and looks forward to seeing them during her visits. Because of her attention to detail, there may even be treats in her pocket. 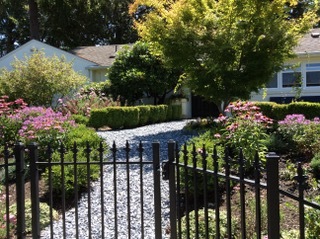 A new entry gate, salt & pepper crushed rock pathway and Boxwood hedge in the background welcome visitors. This concept drawing was used to implement the design. The original curved Boxwood hedge is shown in the upper left. 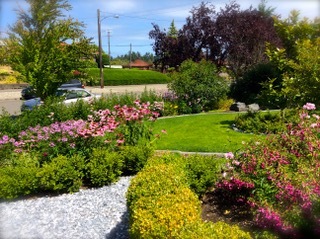 This view looks towards the lawn, with perennials in the foreground. A 10-year-old perennial cottage style garden was past its prime and more than the homeowner, who travels for work, could tackle by herself. She still desired plantings that require her attention when home during the growing season, providing a relaxing hobby and prompting memories of gardening with her father years ago. The homeowner's passion for a beautiful front garden came from her dad's own attention to detail and pride in gardening, something he learned from his Norwegian immigrant father. The challenge for the designer was to create order, allow for bountiful blooms, indulge a passion for pink, and provide a touch of traditional London gardens, while maintaining a balance between low maintenance and giving the homeowner her weekend respite. The approach was to decide which plantings should stay, be repurposed or returned to nature. An existing Japanese maple, a curved Boxwood hedge and Lilac were worked into the design. Cues for design included a black family heirloom bench built by the owner’s grandfather over 60 years ago, a white house and black front door. New additions included a wrought iron fence at property corners with gently curving end panels. A formal entry gate in the middle provided the order needed from the outside. The gaps were filled in with evergreen, Escallonia x ‘Newport Dwarf,’ to create a living fence. A slight grade change afforded the opportunity to add concrete curbing on which to mount the fence and reduce the slope. The 24-inch set back between the sidewalk and fence was filled with low maintenance and tough-as-nails, evergreen Geranium macrorrhizum Bigroot. On the inside three more curving boxwood hedges, Buxus sempervirens, were added with the existing Japanese maple in the center, just slightly offset from the front door. A new path using salt and pepper crushed rock directs visitors to the home’s entrance. Beds were added and filled with flowering shrubs for year-round structure. Colorful perennials that bloom from spring through fall brought joy to the owner. To the left of the entry, a small lawn was planted to provide a place for the eye to pause and rest. This is the top of the gabion wall, with grasses and new slab steps in view. 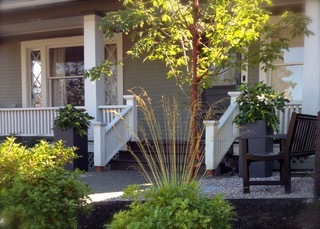 The view of the front yard shows the Paper Bark Maple tree, tall containers and the bench. Hydrangeas and rainbow rock are in the background. Coleus is in the foreground. The empty nesters who live on a corner lot had some general “hopes” for the property. While they wanted a fresh look, they didn’t want the design to take away from their older, more traditional four-square home’s architecture. Their desire was to make the front of the home feel welcoming while eliminating some maintenance headaches. A sloped front yard, making it difficult to mow, topped the priority list. They wanted to reduce maintenance further by doing something about vegetation scattered randomly around the yard. A second set of stairs leading to the front porch was also on the wish list. The owner said, “Susan brought our hopes into reality through a wonderful process of collaboration, giving us choices that worked for our lot and budget and guiding the project along the way.” Collaboration included discussing options for a retaining wall. The challenge was to design a low retaining wall to reduce the height of the slope, but not with a standard modular block system. 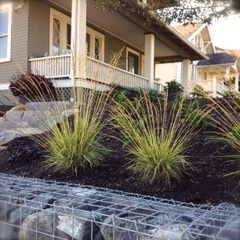 The homeowners chose gabion baskets. Basalt rock was selected as fill material for the baskets to tie in with an existing rock wall at the rear of the property. The industrial look of the gabions worked well and complemented the style of the home. “Susan just naturally shares her knowledge and expertise. She suggested places to ‘visit’ possible plantings and to check out other materials. This was incredibly helpful and informative.” Because the home is situated on a corner and the light exposure varies, Susan worked with the owners to find plantings that would tolerate both sun and partial shade. A place to sit near the front porch was also a requirement. They decided to keep one mature white flowering cherry tree that anchors the corner of the property. All other vegetation about the property was to be repurposed, except for the grass. It had to go. The solutions included Rows of Hydrangea quercifolia “Sikes Dwarf” planted at the crest of the slope to provide a boundary. Molinia caerulea ‘Variegata’ was planted all along the top of the gabions to soften the edge. To fill in the slope evergreen Prunus laurocerasus ‘Mt. Vernon’ dwarf English laurel was used as a ground cover. To make a second set of front porch stairs a reality, concrete slab steps were used. Rainbow river rock inset with 24”x24” concrete pavers replaced the grass. A welcoming feel to the front of the home was created by planters that sit at the base of the porch filled with shade tolerant Mahonia eurybracteata 'Soft Caress.’ Oregon Grape and two tall containers also flank the porch steps with bright Fatsia japonica “Variegata.’ An Acer griseum Paper Bark Maple to the right side of the front steps is close enough for the homeowners to enjoy the attractive peeling bark. 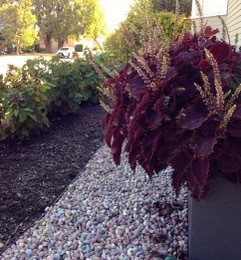 In the summer, beautiful burgundy coleus annuals compliment the overall design. The owners also had this to say, “The project was fun! We felt involved and expertly guided at the same time. Moving from the drawings to reality was exciting and, even these months later, we appreciate the design and plant choices every day. The photos were taken 5 months after being planted.